Heals Boras Rio by Helene Wedel, vintage mid 60s, purple, red, pink, cotton cushion cover, throw pillow cover, homeware decor, 18 x 18 ins. 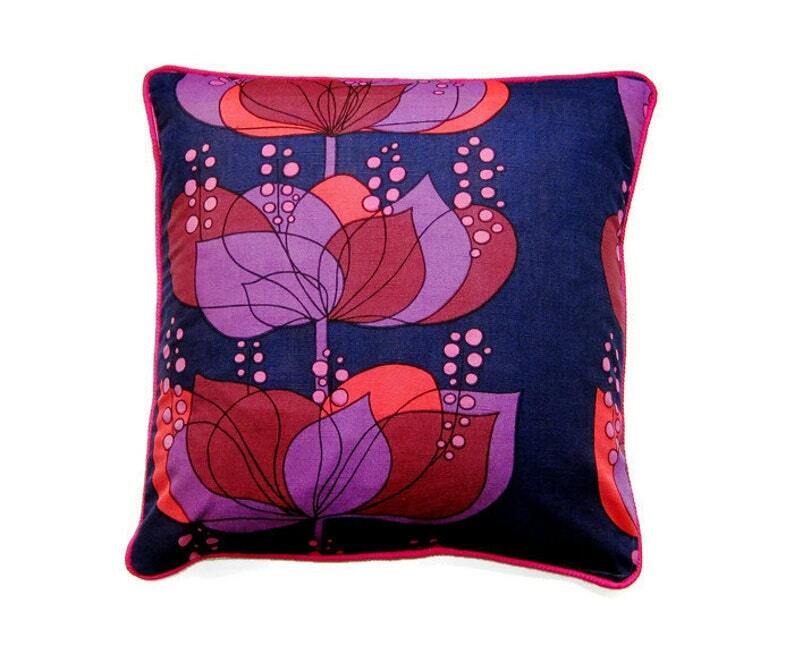 Hand sewn cushion cover made from the Swedish company Boras's iconic sixties design in a rare colour - way. This fabric was originally made up into a curtain but there is no discenible sign of fading - the colours are still very vibrant. The back has been sewn in a beige linen and it has been piped in a matching hot pink cotton. All the seams have been double sewn and four stitched overlocked for strength. The cushion has a flap on the reverse for ease of opening. Measures approximately 18 inches ( 45 cms.) square. Mild handwash or dry clean. It can be made up with the large motif on the right side please message me if you would prefer that option. The pillow's actual colours may be ever so slightly different due to my photographic skills and your monitor's colour settings. All my cushions will arrive individually packaged in tissue paper sealed with washi tape. For more cushions and bags, notebooks and accessories please take a look at my shop. All my embroidered notebooks and accessories now have their own little stand - alone shop . I would really love it if you could take the time to check it out. Thank you so much. Heals Helene Wedel Boras 'Rio', vintage mid 60s orange, red and brown cotton cushion cover, throw pillow cover, homeware decor 18 x 18 ins. Heals Helene Wadel Boras 'Rio', vintage mid 60s yellow, orange, green cotton cushion cover, throw pillow cover, homeware decor. Heals Grace Sullivan "Tree-tops", vintage 70s blue, purple, lilac, cotton cushion cover, throw pillow cover, homeware decor 18 x 18 ins. Heals Helene Wedel Boras 'Rio', vintage mid 60s brown, camel and beige cushion cover, throw pillow cover, homeware decor 18 x 18 ins. Heals vintage mid 60s, Peter Perritt Intrigue, brown and olive green cotton cushion cover, throw pillow cover, homeware decor, 12 X 20 ins. Heals Peter Hall "Volution", turquoise blue, green vintage mid 60s cotton cushion cover, throw pillow cover, homeware decor 18 X 18 ins. Heals Boras Rio by Helene Wadel, vintage mid 60s, purple, red, pink, cotton cushion cover, throw pillow cover, homeware decor, 18 x 18 ins. might be my favorite pillow cover...and by now I have a whole collection! great addition to my home. Gorgeous fabric. Really really beautiful. Thank you for all my cushions! Heals Helene Wedel Boras 'Rio', vintage mid 60s orange, red and brown cotton cushion cover, throw pillow cover, homeware decor. Love the pillow. Beautiful job. I accept all credit cards, PayPal and direct payment through Etsy. You can also use a credit card with PayPal without actually signing up for an account. Click the payment button and it will give you the option to pay with a credit card. I do hope that you will be happy with your purchase, however, if there is a problem please do not hesitate to contact me and I will try my best to find an amicable solution. Under EU distance selling regulations you have the right to cancel your order within 14 days of receipt of the goods and receive a full refund. I will gladly refund any unused items within the 14 days but the buyer is responsible for their safe return and the postage costs. Unfortunately I can not accept returns on personalised items and or items which have been specially customised except of course if they prove faulty. Please contact me for further instructions and the return address. For your peace of mind all international orders are sent tracked. If you prefer I can send your order by the regular ordinary UK Royal Mail service. Please message me and I will gladly refund the difference in cost. Please bear in mind that if you qualify for free shipping it will be sent by either second class post if you reside in the UK or for international customers by standard international Royal Mail, which is NOT tracked. Purchases will ship out in the order that they are received - on a first come, first served basis. All local UK parcels will be sent first class post by British Royal Mail with the option to upgrade to tracked and signed for on delivery. For parcels that haven't arrived in the recommended time frame I suggest waiting at least thirty business days for international customers and ten days for the UK. If you've still not received it by this time, please get in touch. Your items will be shipped to the address shown on your Etsy order unless you tell me otherwise. Please check your Paypal and / or Etsy profile to ensure it is correct as unfortunately I cannot be held responsible for mail that is misdirected due to an incorrect or incomplete address. International customers please be advised that customs fees or import taxes may apply. These are not covered by my shipping fees and I am unfortunately unable to pay them on your behalf. Could you please check your government's import laws before purchasing. Thanks ever so much. Please note I am not VAT Registered and therefore VAT is not included in any of my prices contrary to Etsy's mandatory statement directly below each listing. Wholesale enquiries are always welcome. Also if you wish to purchase a large amount of items please contact me first and I will arrange a discount either off the total cost or from the shipping price. I am more than happy to accept custom orders and commissions. I am always open to suggestions so if you have an idea for a cushion or a notebook cover or whatever else takes your fancy please run it past me and I will see if I can make it. Or if you have seen something that you like in my shop but you would, perhaps, prefer a different colour or material or that I alter the design a little no problem at all I will try to meet your requirements. International customers please be aware that while I do make every effort to answer all messages and queries as promptly as possible there may be a delay due to time differences. Heals vintage mid 60s, Peter Perritt Monaco dark blue, yellow, brown cotton cushion cover, throw pillow cover, homeware decor, 18 X 18 ins. Heals, Ritwa Wahlstrom for Boras "Rapsodi", vintage mid 60s, pink, red and purple cotton cushion cover, throw pillow cover, homeware decor. Heals vintage mid 60s, Peter Perritt Monaco red, purple, orange cotton cushion cover, throw pillow cover, homeware decor, 18 X 18 ins. Boras 'Rio' by Helene Wedel vintage mid 60s brown, orange, olive, Swedish cotton print, cushion cover, throw pillow cover, homeware decor. Heals Humphrey Spender, "Sirocco", late 70s, red, green and beige cotton cushion cover, throw pillow cover, homeware decor 18 x 18 inches. Heals Peter Hall "Rossetti" blue, brown, green, vintage mid 70s, cotton cushion cover, throw pillow cover, homeware decor. Heals David Bartle "Fandango", yellow, green, gray, vintage early 70s cotton cushion cover, throw pillow cover, homeware decor 18 x 18 ins.